EMS University was established in 2010 in San Diego, California. The program is located in Miramar, North of the MCAS. 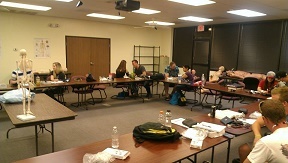 EMS University - San Diego has been providing instruction to EMTs, the general public and heathcare professionals for Basic Life Programs. In 2014, we began offering Paramedic Refresher courses and CE for all EMS providers. We are certified by the County of San Diego EMS Authority and California EMS Authority to provide CE for recertification. Additionally, we are accredited by CECBEMS to offer CE courses across the country. Our 2000 square foot facility and large/open classroom is ideal for students both learning how to become an EMS Provider and to become a better EMS Professional. Our programs are fun, fast paced, challenging, and rewarding. Finally, it is our desire that you feel comfortable and at home - we think of our students as family and want them to succeed in the classroom and beyond!